Note: You can enter this giveaway three (3) times per e-mail address per day. Deadline is 11:59PM ET 9.18.18. If you’ve ever wished you had extra help in the kitchen for all those prep jobs, the Cuisinart Pro Classic 7-Cup Food Processor has got your back. 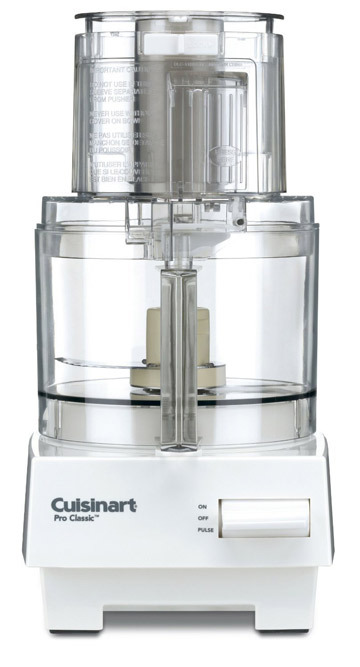 This machine can help you make all your favorites from Ginger and Carrot Stir-Fry and salads, to Homemade Peanut Butter and bread. The 7-cup work bowl can accommodate all your needs and the extra-large feed tube holds whole fruits and vegetables – no extra slicing and dicing needed. A stainless-steel medium slicing disc, stainless-steel shredding disc, chopping blade, small and large pushers, detachable disc stem, compact flat cover, spatula, and instruction/recipe book are also included. This processor may be the best sous chef ever. NO PURCHASE NECESSARY TO ENTER OR WIN. Void where prohibited by law. Open to legal residents of the 50 U.S., D.C. and Canada (excluding Quebec) who are at least eighteen years old at the time of entry and have internet access. Begins on 7.23.18 at 12:00:00 a.m. ET and ends on 9.18.18 at 11:59:59 p.m. ET. To enter the giveaway, submit your full name and email address on this form. Odds of winning this giveaway depend on the total number of eligible entries received. Only three (3) entries per email address per day. Sponsored by Leite’s Culinaria, Inc. For more information, visit our Official Rules. For a list of winners, check out our Very Happy Winners page. Be sure to add giveaways@leitesculinaria.com to ensure notification if you are the winner.